Skimming the freshmeat announcements, I noticed this little gem: MailNotifier, an extension for Firefox that does as its name suggests. Just beautiful. That’s a laundry list of how not to design an interface, right there. The fields are not left aligned. That makes it unnecessarily hard to read. Particularly if the input fields are filled in, the layout presents no visual cues for the eye to rest. This is further exacerbated by the next issue. No grouping. That makes it hard to get a quick idea of the functionality provided by the dialog and hard to find a particular part of it if you know what you’re looking for. Obviously, then, no thought was given to which options would be needed more frequently than others. The email client related options should be hidden away under a button. Their initial values should be autodetected if possible; that includes researching a list of email clients and their arguments and scanning a handful of likely locations on the user’s harddrive for their presence. “Max detailed notifications” is a numeric field with a constrained range of allowed inputs. A free-form textbox is the worst possible interface choice for such a parameter. A slider is the optimal one. 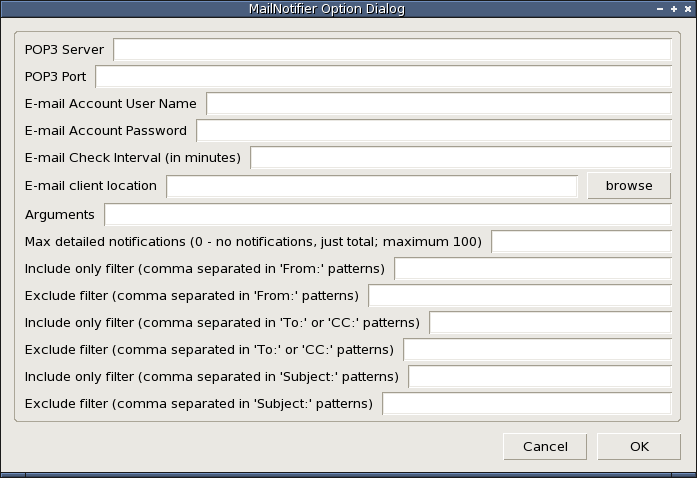 The filter string lists are given as comma separated lists in textboxes. That is very programmer-friendly, it requires a minimum of effort for implementation, but it’s a pain in the bottocks to actually use. This is inexcusable. The correct interface element is a list to which you can add entries using a textbox and include/exclude buttons, and from which you can delete entries with another button. This is how the Firefox dialogs for sites allowed to set cookies, to install extensions, or to show popups work. I won’t even go into the fact that a design which is globally limited to a single checkable mailbox is fundamentally functionally flawed. Referenced in Usable interfaces just take a little thought.